One thing that is important to us on our family trips is getting everyone a good night sleep. Travelling can take a lot out of a baby or toddler, so we want to make sure we are doing what we can to get baby to sleep on vacation! The first step for us is making sure we have the best baby bed for travel that’s lightweight and portable, but more importantly that will provide a safe and comfortable sleep for our baby while traveling. Traveling with a baby still means dealing with all that parenting stuff (ahem, night wakings!) so getting baby to sleep means we also get to sleep! The first step for us is deciding what type of accommodations will work best for our family. We were happy with booking hotel rooms until our daughter was able to stand and see us over the top of her travel crib (I wish we had one of these SlumberPods then!). There are still ways to make this work (ahem, hotel bathroom or closet), but we also really enjoy staying in an Airbnb or VRBO apartment with a baby or toddler. This is more our style especially now when we are travelling with a toddler. It gives us more space and gives us the ability to separate our kids if needed so they aren’t waking each other at night. What does this have to do with finding the best travel crib? It’s important to understand what your style of travel is before buying a portable baby bed. Though we want to help you find the best baby travel cot, it’s good to know the other baby travel bed options before buying and for this, you’ll need to know where you plan on staying. Now that accommodations are booked, it’s time to start thinking about the best travel bed for baby or toddler travel bed for your traveling with your baby or toddler. Before we recommend the best portable baby travel bed to buy, there are several other great options to consider. Not all will work for every family, so choose which is best for yours. If buying a portable cot is the best option for your family, we’ve included portable crib options for infants, babies and toddlers below. For more portable bed options for older toddlers, we’ve created this post on finding the best toddler travel bed. 1. Contact your hotel to see if they can provide a baby travel cot. If they will have a travel crib available, send them an email a few days before you arrive to confirm that one will be available for your stay. 2. If you are staying in a vacation rental like Airbnb or VRBO, contact your host to see if they have a baby or toddler travel crib available. Even though it is not part of the listing, they may still have one available or can access one for you. 3. 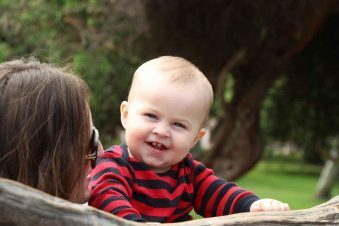 Find a reputable baby equipment company in the area. Often you will find you can get a safe, sanitized baby travel crib or toddler travel bed delivered right to your hotel or apartment. Don’t forget to read the reviews to make sure others have been happy with their service. 4. Depending on where you are travelling, consider having a toddler or baby travel bed delivered right to your destination from Amazon. Make sure to contact your hotel or apartment host to see if this is possible (in case it arrives before you do). This is also a great option if you are visiting family and plan to do so frequently. For co-sleeping families, the Dock-A-Tot makes a safe sleeping situation while travelling with your baby. It can also be used for play, tummy time and diaper changes. 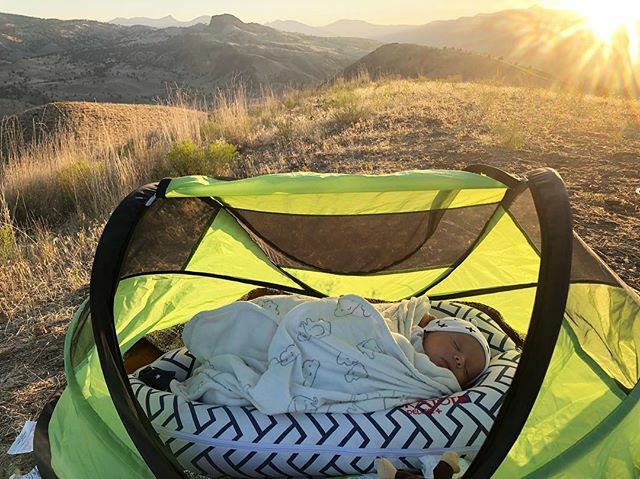 The womb-like design may be just what you need to keep your baby sleeping through the night even while you travel. 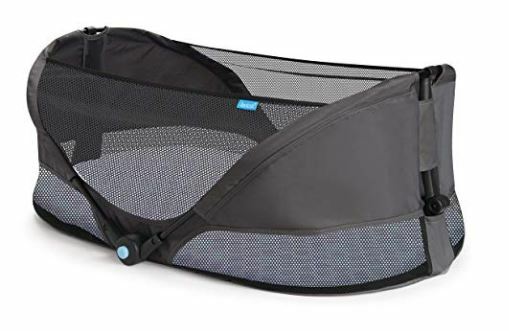 You will likely need to take it as an extra piece of luggage, but at only 3-5 lbs it’s a very lightweight baby travel bed. Click here to get the latest prices. *Please be aware that Health Canada has not approved the Dock-A-Tot as a bassinet, crib or cradle. You can read more about it on the Dock-A-Tot website. Looking for a newborn travel bed? 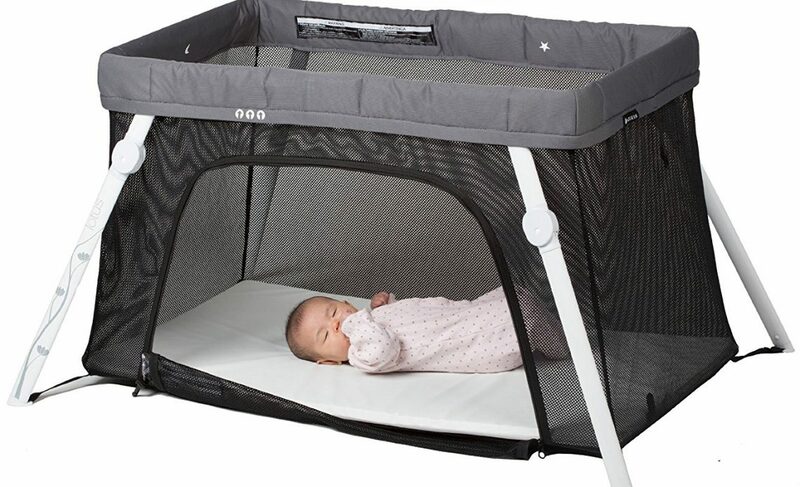 We like this travel bassinet as an infant travel bed because it has a firm mattress and fitted sheet to create a safe sleep environment for your baby. It folds flat in seconds and includes convenient carrying handles, but can also fit in a suitcase. 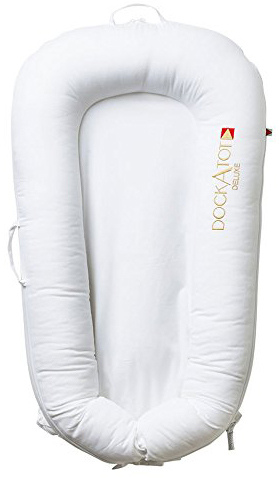 At only 2.4 lbs, it’s a great option for your 0 to 3 month old (discontinue use at 3 months or 15 lbs and if your baby is up on their hands and knees). If your baby is up on their hands and knees, it’s time to move on to one of the other baby travel cribs listed! Click here to get the latest pricing on the Brica Fold n’ Go Travel Bassinet. 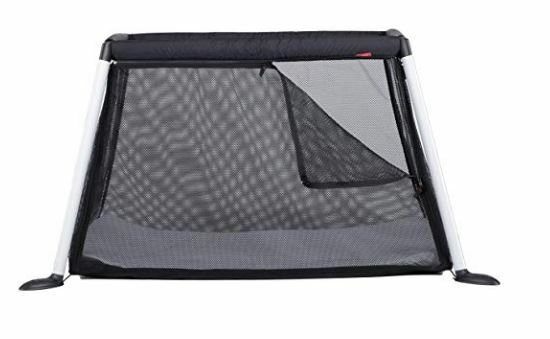 *There is no upper weight limit for the portable baby travel cribs since the mattress is on the floor, but discontinue use if your toddler can climb out. 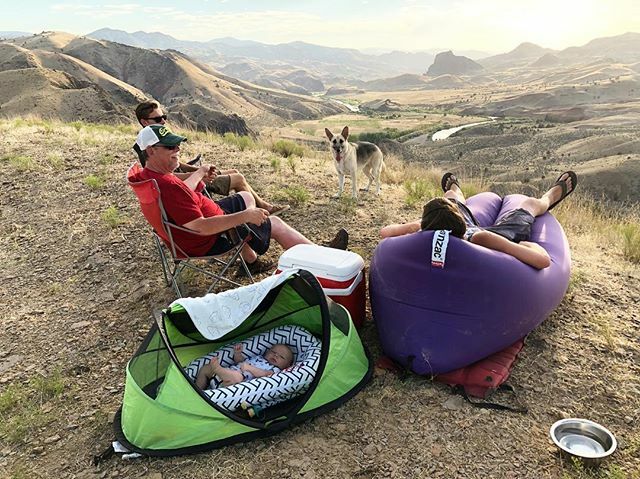 The Lotus travel crib by Guava Family is a lightweight travel cot with backpack portability and sets up in 15 seconds. This travel crib is approved for use from birth to 3 years old. At only 13 lbs and claims that it fits as a carry-on, you could even use it for naps in the airport! With a side door that zips open, your little one will even have their own safe area to play wherever your travels take you! 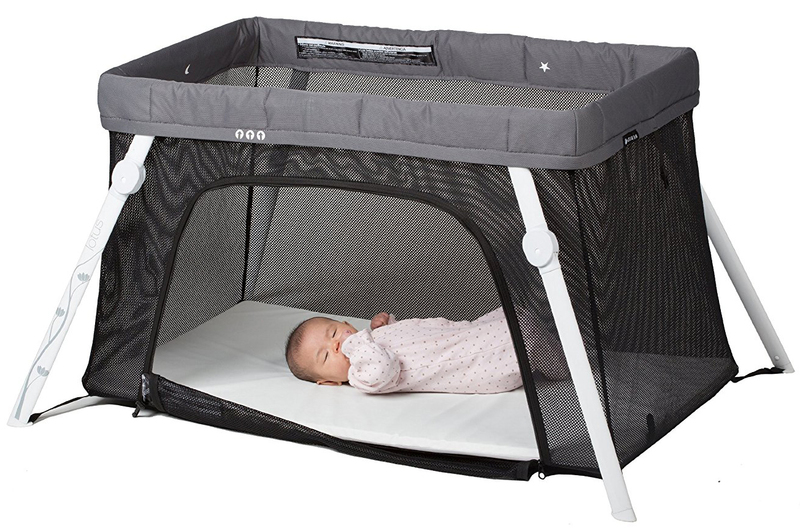 With over 600 reviews on Amazon and a very high star rating, this travel crib is sure to please everyone! Click here to check the price on the Lotus travel crib. We LOVE ours and it’s been all over with us! After 3 kids, I can say it’s the best thing ever! My daughter actually prefers to sleep in it at home too! At a similar weight (11 lbs) and size as the Guava Lotus travel crib, the Baby Bjorn travel crib is also easy to bring along and set up. Though it does not fit as a carry-on, it can still be gate checked. It does have an added benefit of having removable mattress cover and crib fabric that is machine washable. 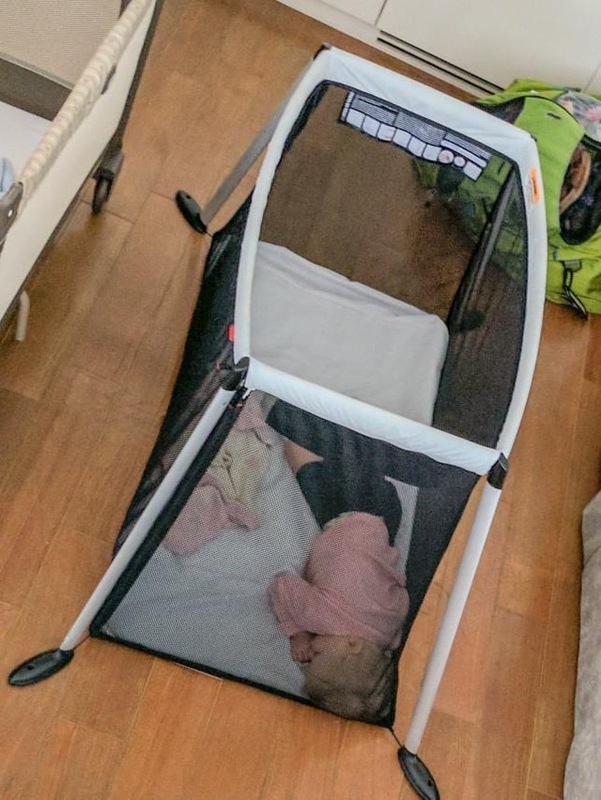 This travel crib can be used from 0 to 3 years old, so if you buy it early you’ll get plenty of use out of it as you can continue to use it as a toddler travel cot. This was easily one of our best purchases ever! We love how it’s so lightweight and easy to set up. It works for both our kids (1 & 2.5 yo) and we see ourselves using this for a long time! We love our Baby Bjorn travel crib! It’s so easy to fold and very lightweight. 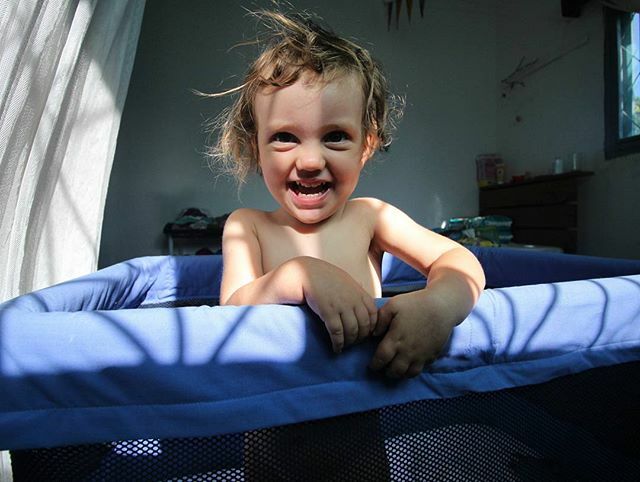 Ramona slept great in it while in Mozambique! 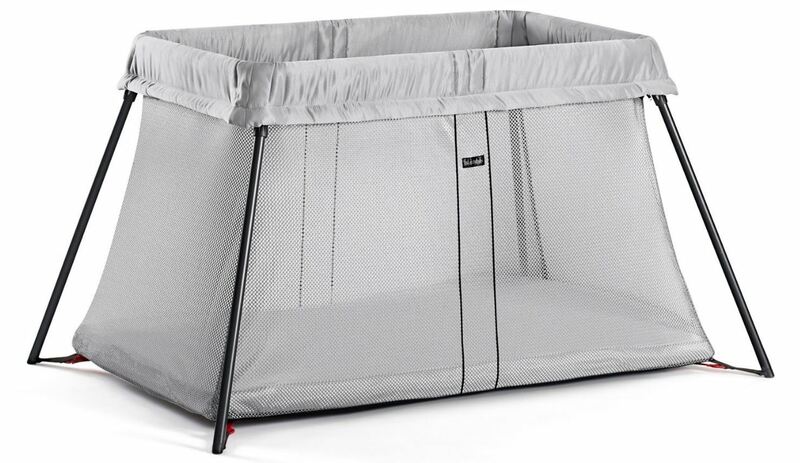 If you are looking for a strudy and modern looking portable crib, this is the one to buy. The Phil&Teds Traveller Crib is one the top travel cots for babies, right up there with the Lotus and Baby Bjorn travel cribs. It’s super light at 6 lbs and rolls up to the size of a yoga mat. It also comes with a self-inflating mattress and the fitted sheet is included with the travel cot. The Phil&Teds is suitable from birth until about 2-3 years old (< 35” tall). Aside from being super lightweight and portable, the Phil&teds traveller crib comes at a much cheaper price. Click here to check the latest price on the phil&teds traveller crib. We travelled Europe for 8 weeks with our Phil and Teds Travel cot. 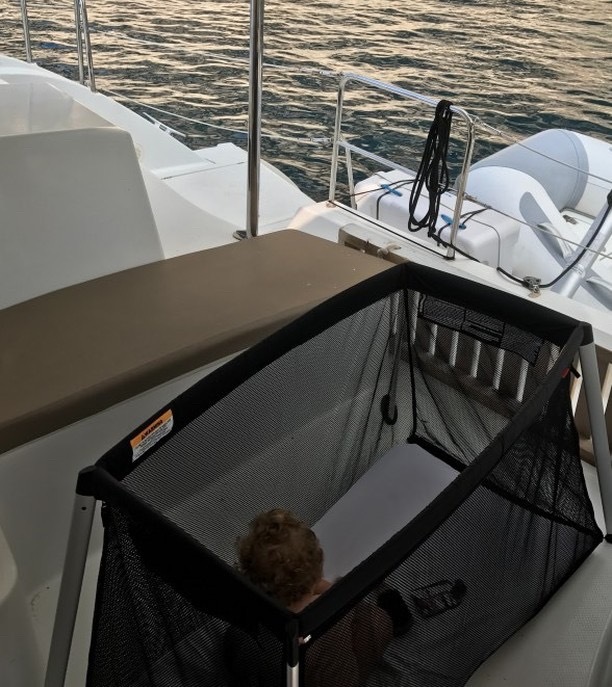 I initially purchased it for sailing Italy as a safe play pen for our crawling 10 month old. I love the bag, easy assembly and it weighs under 3 kilos! We love the Phil&Teds travel crib! We traveled full time with twin toddlers and the Phil&Teds is the smallest, lightest travel crib we could find. We could pack two in a suitcase and still have room left over. The mattress is thin and light, but our kids slept great on them every night for over a year. When they moved to “big kid beds” I was so sad to say goodbye to the Phil & Teds! 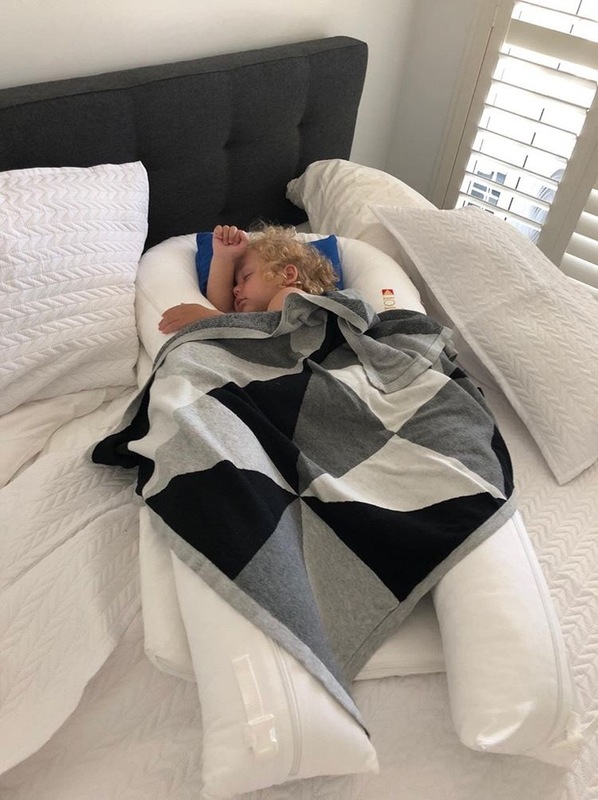 If you are looking for a travel bed for a 1 year old (or older), the PeaPod and PeaPod Plus make an excellent travel bed for toddlers. It’s weight (3.5lbs for the larger PeaPod Plus) and size make it super compact and allow it to be packed right in the suitcase. The larger PeaPod Plus can be used up to 5 years old, ensuring you will get plenty of use out of it. 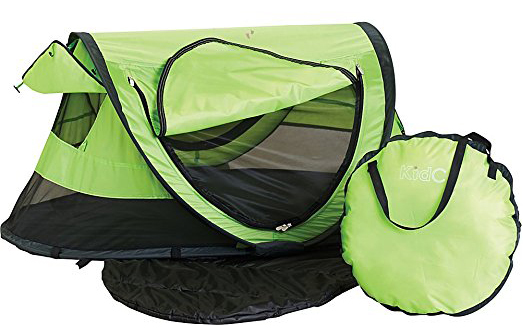 This toddler travel tent is also good, since you don’t need to worry about the possibility of your toddler trying to climb out like the other travel cots above. Click here for the price of the PeaPod or PeaPod Plus. We travel with the PeaPod Plus and enjoy it so much that we have included it in our “must have” baby travel items. We absolutely LOVE this one! It’s super small, compact, lightweight and so easy to set up. Our son loves sleeping in his own tent at night and love playing in it during the day. Bonus: We have a Baby Bjorn travel crib and this one fits INSIDE the same case!! 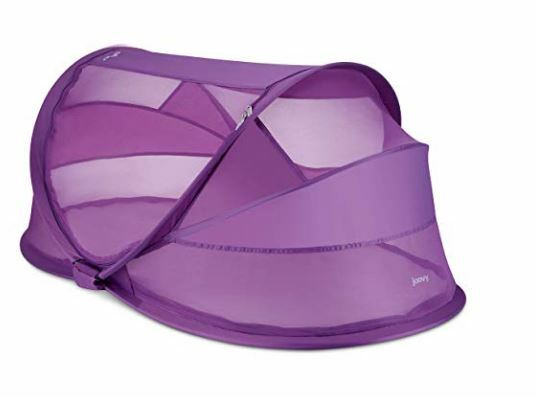 The Joovy Gloo Infant travel bed is a pop-up tent, similar to the popular KidCo PeaPod. The Joovy Gloo also comes in two sizes, regular and large, that are rated up to 3 years old and 5 years old, respectively. One big difference between the Joovy Gloo and the KidCo PeaPod is that it is approved for use from birth. It’s also slightly more expensive and heavier than the KidCo PeaPod. It has UPF 50 sun protection, making it a baby beach essential, and a self-inflating mattress. Unfortunately, there aren’t any reviews on it yet making it a slightly more risky purchase. We do recommend going with the large size if you plan to purchase a Joovy Gloo Infant Travel Bed, since you’ll get the most value out of it for your money. Click here to check the price on the Joovy Gloo Regular and the Joovy Gloo Large. 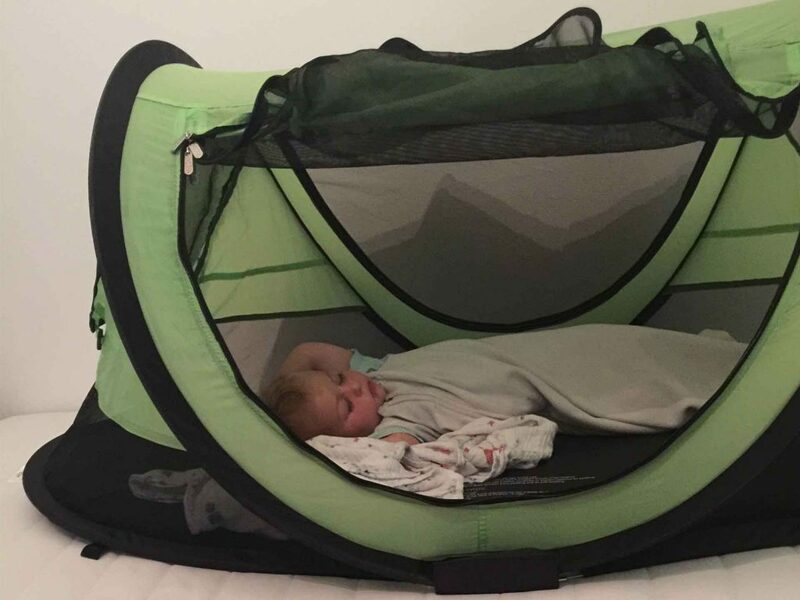 No longer want a travel crib for a toddler? Or perhaps your toddler is trying to climb out or doesn’t like the toddler travel tent? There may become a point where a travel cot just doesn’t work for your toddler, but he just isn’t quite ready for an adult bed yet. We have all the best toddler travel beds in this post. Looking for the perfect high chair, baby carrier or stroller for travel with a baby or toddler?